Today, I answered another HELP!!!! email from a parent who requested a due process hearing and doesn’t know what to do next. Yesterday, I answered an email from a parent who initiated a due process hearing and lost. The parent filed an appeal in federal court and wanted advice about how to write a legal brief. These emails led me to offer some advice about litigation. Neither of these cases are likely to have a good outcome. Before initiating litigation, parents need to spend time learning how the legal system works. 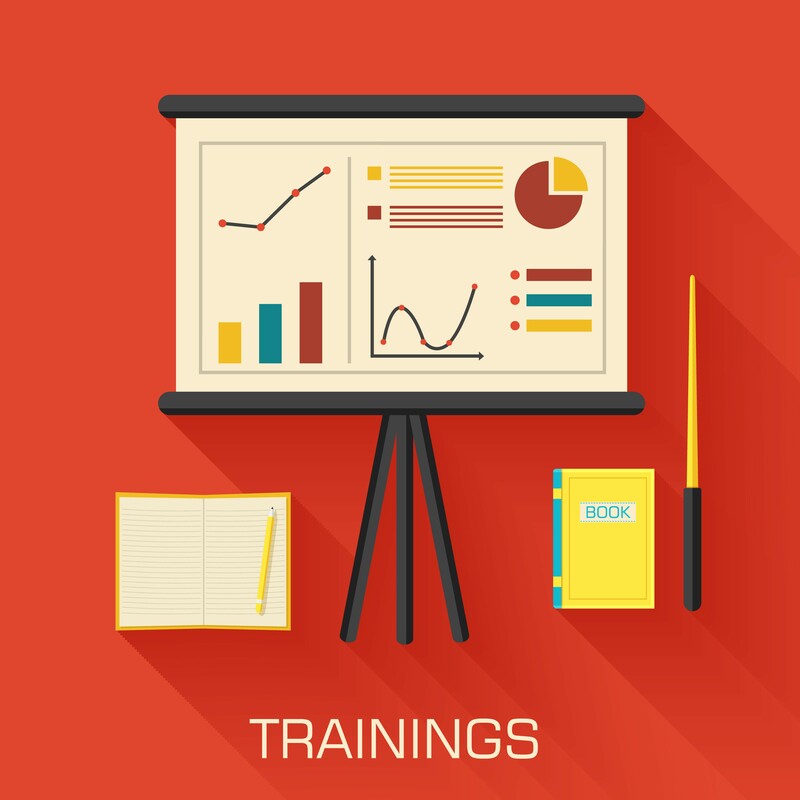 If you are not familiar with the law and litigation, consider taking a few courses. You need to know the rules of court, how to do legal research, etc. In all litigation — criminal, civil, personal injury, breach of contract — there are many issues that can be presented by each side and argued vigorously. In special education litigation (as in a divorce, child custody case), the parents and school often have a laundry list of complaints and grievances that go back for years. Most of my cases have multiple violations. As a lawyer, I must organize a mountain of confusing facts and make them clear and simple. I try to focus on my “gut” issue, the issue that will make a neutral person biased in our favor. Develop a compelling theme of the case. Make your case clean and simple. Decisions by judges, hearing officers and juries are rarely based upon the facts and law of a case. Instead, the decision-maker wants to rule for one party, then finds facts and law to support the decision. To learn more about this strategy, I recommend you read How to Argue and Win Every Time by Gerry Spence. This book is not about arguing. How to Argue is about story telling and oral persuasion — the art of getting others to see things through your eyes. I also answered email from a parent who complained about the high costs of legal counsel. Several factors contribute to this problem. Very few attorneys represent children with disabilities, primarily because they cannot make a living in this field. Like parents, attorneys have to make a living. If they can’t make a living representing children with disabilities, they will leave this area of law. Attorneys are appointed to represent indigent criminal defendants. That’s about all in our system of justice. Some ask if taxpayers should pay the attorneys who represent both sides in special education and other kinds of litigation. These questions involve public policy issues that are beyond my competence to answer. Out of every ten parents who consult with me, only one needs an attorney. The parents have a disagreement or dispute with the school about their child’s special education program or placement. They don’t know what to do. Their emotions drive them to do SOMETHING. Parents often request a special education due process hearing when they have no idea what they are getting into. Most parent-school disputes can be resolved without litigation, especially if you have an attorney who can provide advice about what to do and not do. If you are thinking about requesting a due process hearing, consult with an experienced special education attorney before taking that step. Consultation fees are usually low, especially when you consider the cost of litigation. The attorney can give you advice about how to proceed without shooting yourself in the foot. I have another piece of advice for parents who are considering a due process hearing. 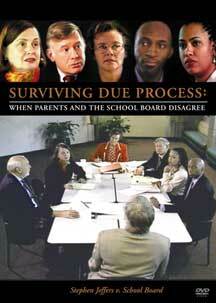 Watch the Surviving Due Process: Stephen Jeffers v. School Board DVD. This DVD is a realistic depiction of what happens in a due process hearing, and it’s based on a real case. 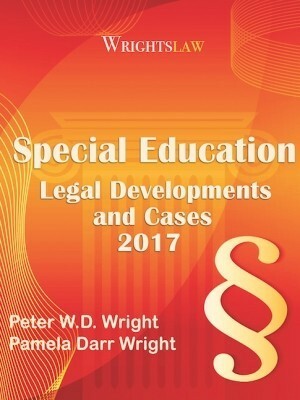 Legal Tip: Some Protection and Advocacy agencies (also called Disability Rights agencies) do an excellent job of representing children with disabilities in special education cases. The South Carolina P & A was involved in the Florence County v. Shannon Carter case from the review hearing, through appeals to the District Court, the Court of Appeals for the Fourth Circuit, and U. S. Supreme Court. Their assistance was invaluable, and I will always be grateful to them. 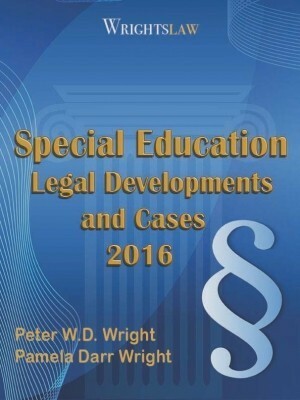 This entry was posted in Attorneys, Due Process, IEPs, Legal News, State Complaints, Strategies and tagged attorneys fees, Due Process Hearing, Litigation, Pete Wright by Pete Wright. Bookmark the permalink. I was told that federal statute only allows compensatory services (out of school extra teaching help and other services) and possibly attorneys fees in litigation for Due Process complaints. Is there any scenario where I can sue for monetary damages for emotional damage or anything else you can think of where monetary damages can be awarded? Did you ever get an answer to this question? Our special education due process hearing was completed in Nov 2015. The judge has not yet given decision after one year. Is there anything we can do?? The attorney says we have to wait. 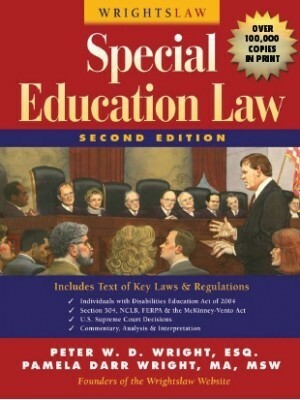 Thanks for your information about special education and the litigation process. I have a couple of friends that have children with autism or down syndrome. That’s interesting that very few attorneys will represent children or parents with disabilities. However, I’m sure there is a lot of legal issues regarding disabilities and many schools have policies in place to address these concerns. I bet even getting some legal advice from a special education attorney can at least point parents in the right direction to help them get their concerns addressed. Thanks for the links. 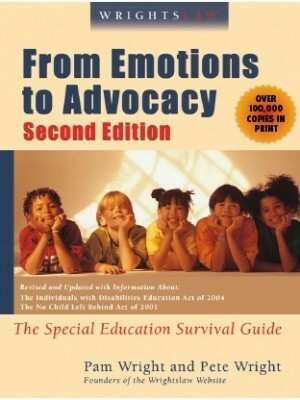 Hello, I am an educational advocate in California who represents children with disabilities. It is extremely important that you document everything and what you have a complaint on, is proved through paper trail. If you don’t have any, start now by writing your concerns and asking your school for help. Put it in writing and keep a copy. Hi Gloria, where are you located, I’m in the Bay area and going through a situation with my son that has IEP. I’ve contacted Disability Rights & other advocacy agencies, each one stated that they do not have the resources for due process hearings & to consult with an attorney that specializes in these cases. It’s been almost a month since my daughters IEP & the school district is ignoring my phone calls, emails & letters. This was our first & my daughter hasn’t had any therapy since her 3rd birthday 3 weeks ago. I am working on an advocacy where the parents are employed by the school district their child attends. There is a chance that a due processing hearing may be necessary to ensure the student receives accommodations; however, the parents do not want to threaten the school with any legal action. I am concerned that without some type of threat the school is unlikely to move forward with the needed assistance and I do not want to make any empty threats. Do you know of any case law that protects the parents jobs? Or if the teachers unions have some type of code that would protect them? They are in the state of Pennsylvania. Thank you in advance for your assistance. I am a mother of three. Two are low functioning non verbal autism and one is high functioning autistic. My child was sexually abused by an older classmate while during school hours with three special ed teachers supervising. My son should never have been left alone and unsupervised. I have had my son speak with the district crisis counselor who confirmed the act. My child has been out of school/instruction for approximately 2 wks. The school insists my child must be returned to school. However, the older child remains in the class room and in the program. I fear that this has made affects on my son. Furthermore, I cannot return my son to the same environment if the school was negligent and allowed in-proper supervision of our children. What rights does my son have. I have two other disabled children in the same district pending IEPs. I need an attorney in Michigan to help with an appeal. I lost in due process and feel I did a very good job presenting my case. The ALJ simply was extremely biased and they had NO outside witnesses, or experts. Almost all of the school employees flat out lied, some I can prove. Futhermore, I would like to file a discrimination lawsuit against the school as well. Can you please give me any names of attornies who would like to chat with me? I have just discovered your site and am in the process of checking out all of the resources available. We are very much in a crisis with my younger brother 18 and learning disabled. He has missed several days of school and the teachers are trying to get him to drop out. My mother was even told she could be fined $50 per day and that it would all go away fi she would consent to him withdrawing. This comes as we recently discover for years and throughout middle school he was taught off of grade level..until reaching high school. I called about requesting an authorization form to release records from the district and they wanted to give me a run around about not telling them why I wanted them. I know of 3 other students “forced to quit” as well. Is there such a thing as a class action suit in education? I know how if feels when you don’t think your child is getting the services and direction he/she needs. I have been as frustrated and mad as anyone on this blog, hands down. I have also seen my son, who has Aspergers, experience success. As long as I wanted to argue, the district staff had plenty of folks to keep me at bay. 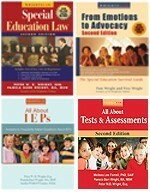 After reading From Emotions to Advocacy (and I stopped believing that these things won’t work in our unique situation) I began contributing to the IEP team and diplomatically set goals with timelines. If they did not work we did something different. Success can be had without micro-managing delivery of services. My son is on the National Honor Role. The folks that I used to think were holding him back have no power over him or over my family. Barb-Good Question-On Notification of an IEP-Our State DOE, SC, has actually put this into the state regs, that the name of the person is not important, only the position………why would I as a parent want someone who has never worked with my kid to serve as the “special ed teacher” etc……………I have requested clarification on this very issue from the US DOE, if I get a response I will post it. Pete and Pam, what is your take on it? On Notification of an IEP form can the school leave out the names of the people attending and just put things like Special Education teacher, School District Representative or do we as parents of a child with and IEP have the right to specific names? My son has autism. Just recently the middle school he his attending cut of all communication with teachers. The only person we can contact is the principal and he will only respond once a week. What are our legal rights with regard to communication issues? My son is 17 and a sophmore in high school. In the 5th grade, our home school sent him to a neighboring town’s school because the home school did not have a cross cat program. He has adjusted and is doing exceptionally well where he is at. He has reg. ed. as well as cross cat friends at his new school. Meanwhile the kids in our hometown have shunned him and even try to beat him up since he moved to the new school. His teacher’s love him and he is one of their sucess stories. cat program. The classes will be very small and not offer near what is offered at his present school. Is there anything I can do to prevent this? Do we have any rights? Basically, NYC agreed to stipulations this year – and “conveniently” forgot to sign them. Everyone I know is back on the docket this year as few people recieved a countersigned stip back since Sept. Next year the advocacy service is telling most of it’s clients to go straight to IEP Hearing. Since Ke Bank is out of special we loan business – patents are suspecting NYC is doing this on purpose in order to close these schools. How can parents deal with this in general? I am in Massachusetts and my LD daughter has been denied use of a calculator on MCAS, despite the fact that she has never passed previous MCAS tests and has “use of a calculator” for math in her IEP. How can I fight this? Ruth: I put these search terms into the Google search box: “test accommodations in MCAS”. 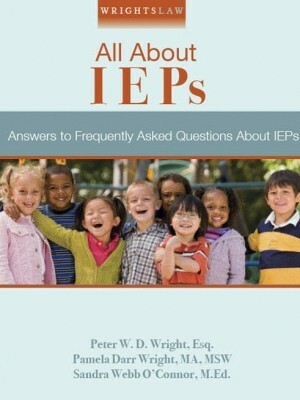 I don’t know if your child has an IEP or 504 Plan. I don’t know if the IEP team wrote that she needs a calculator as an accommodation on the MCAS test in her IEP. 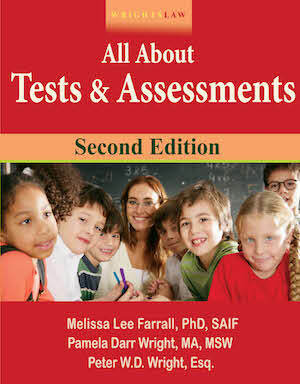 I do know you need to do some research to determine your child’s rights to accommodations on the MCAS test. The document (above) should help you get started. I am very passionate about working with children with disabilities. Currently I work as a job coach in several school districts in just that capacity. I have since returned to school to pursue a post-degree certificate in legal studies. My goal is to support parents and help them find solutions to their problems. What can I do in order to get started in a consultation capacity? I look forward to your response. Thanks. 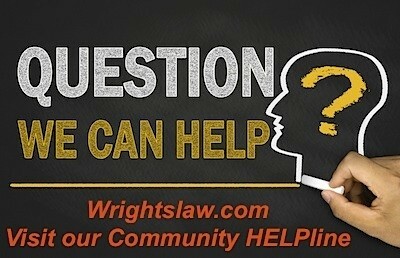 How do the paralegals for Wrightslaw receive funding? What are the qualifications for serving as a paralegal for Wrightslaw? Raymond: Parents have the right to request a due process hearing – this is a procedural safeguard. Section 1415(f) of the IDEA describes the requirements for due process hearings and the Resolution Session that may allow the parties to resolve their dispute before a due process hearing is held. If a hearing is held, the hearing officer or ALJ will issue a decision. Either party may appeal the hearing officer’s decision. Federal courts, not school district, have the authority to award attorneys fees. The Court may award “reasonable attorneys fees” to the prevailing party. If the Court determines that the parent’s attorney or parent filed a complaint or cause of action that is “frivolous, unreasonable, or without foundation” the Court may award attorneys fees to the district or SEA from that attorney or parent. If the Court determines that the parent’s attorney or parent filed a complaint or other cause of action that “was presented for any improper purpose, such as to harass, or cause unnecessary delay, or to needlessly increase the cost of litigation,” the Court may award attorneys fees to the district or SEA. The provision about awarding attorneys’ fees against a party “who continued to litigate after litigation clearly became frivolous, unreasonable, or without foundation” is not new in civil litigation. Congress added these provisions to IDEA when the law was reauthorized in 2004. You asked for advice. We don’t know the whole story. We don’t know what state you live in and how much litigation you have engaged in on behalf or your children. I urge you to consult with an experienced special ed attorney who can look at the facts in your case, your state laws, and recommend a course of action. My school district came up with a new plan to disuade parents from filing a due process complaint. If you file one they respond with a motion to dismiss and then request Attorneys fees under 300.517. Basically they put you on notice that if you don’t win they are going after you for $1,000’s of dollars. Additionally, because I appealed an ALJ decision and was ruled against on that, they have filed a motion for fees in the amount of 140K. I’m not asking how can they do this because they have done it. I am asking what now? David: I wish more people realized this – that the role of victim is not healthy and it doesn’t help you get what you want and need for your child. When parents take on that role, they defeat their purpose – to get the school to provide the services their child needs. I rarely recommend that parents file complaints with the state dept of ed because they are usually a waste of time and energy. I’ve heard that a few state departments of ed do investigate complaints but they are in the minority. Pat is from Indiana, I am from Virginia. Our experiences with state complaints are similar. One problem is that state DOE employees don’t view themselves as enforcers of the law. Another is that most state DOE employees were employed by school districts and view local district employees as friends or colleagues. 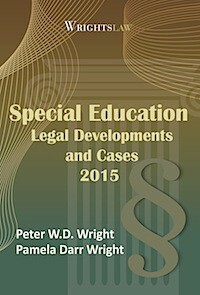 Thank you Pete for your dedication to special education law. I remember writing in on a similar topic expressing my opinion that legal fees for school district’s should be capped. Your response was in effect that life is not fair. You are absolutely right. As long as I allowed my family to play the part of victim, we lived like victims. Once I began reading and empowering myself, we began to live my son’s success story. We have never done due process or file a law suit to obtain meaningful and measurable educational services for my son. The concept of Due Process scares me to death! What about the State Complaint process. I understand there are limitations but aren’t there situations where a State Complaint could accomplish the goal of ensuring FAPE? I’m currently considering filing 3 state complaints regarding refusals to provide FAPE … or let me rephrase. I currently have 3 “refusals” which I believe are violations of Section 504 and IDEA, each raising to the level of causing harm; therefore I MUST do something. Do I write my “letter to a stranger” ? Do I quote the Regs. that have been violated or do I just provide a chronological list of events?